Master PDF Editor – Professional PDF Editing. Although PDF documents are best for printing, editing them can be a real pain. Of course, the PDF format isn’t supposed to be edited, but sometimes you just need to adjust texts, insert a new image or polish the final document some other way. Traditionally, whenever you need to modify a PDF document you first need to convert it to some other format that does allow editing, this could be RTF or DOC formats. There are plenty of tools doing that, but alas! – conversion errors are not rare, some elements cannot be edited at all, and you still need to convert the file back to PDF then. Master PDF Editor uses a completely different approach to this task virtually overriding the term “PDF editing” towards a more conventional sense. Instead of back and forth converting, you simply open a PDF file in Master PDF Editor and… edit it! That’s it! Any element of a PDF document opened in Master PDF Editor can be easily modified, including text, colors, fonts, size and position. The corrections are made in an easy, intuitive way, using text editing principles common for any text processor. With a click you can insert a new image, or a form, or adjust parameters of every single object in the PDF. No special knowledge or procedures are required for that. 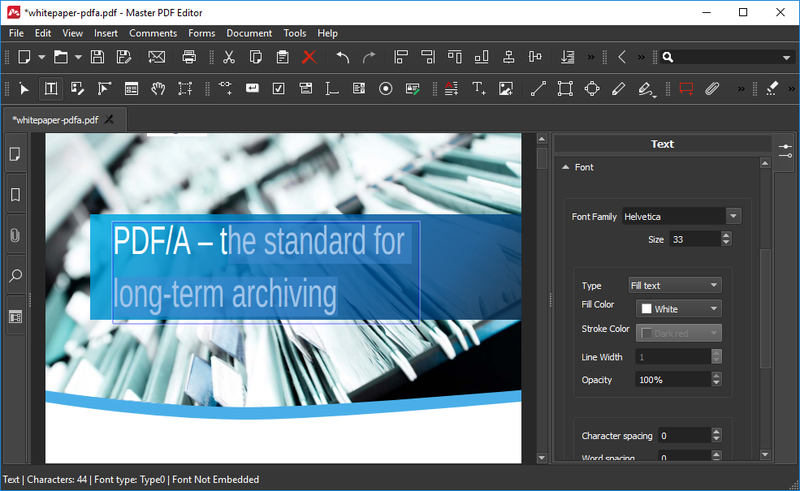 Master PDF Editor is a cross-platform application supporting all Windows OSes starting from XP, Linux OS and macOS 10.7 or above. The program doesn’t require any fonts embedded into a PDF file, nor it requires a source document the PDF was built from. Master PDF Editor provides you with all the convenience you ever wanted for editing PDFs, but didn’t have.